Arcade Hunters: Killer Shark Items! 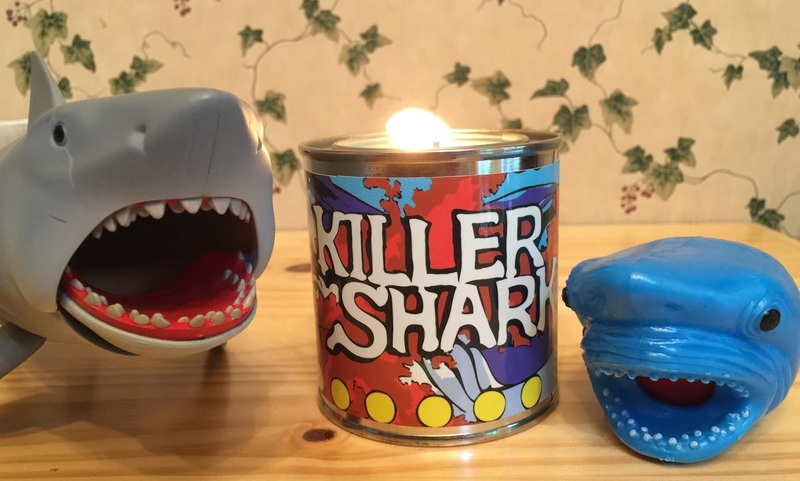 I ordered the Killer Shark candle and flag from Horror Decor which also came with a pouch of some extra little goodies. There was also a pillow available in the same design as the flag. Overall the quality of both products are top notch, which I have come to expect from Horror Decor. They offer great obscure products that delve both into horror and arcade/video game worlds. It is especially great when the two collide. 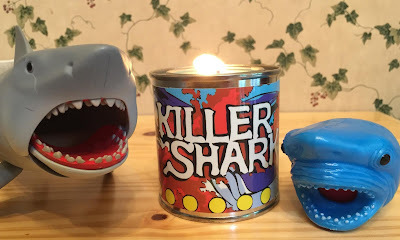 The candle has a high quality glossy printed label of the Killer Shark marquee. Again, the image is high quality and appears to have been recreated faithfully right down to the old SEGA logo; this isn't a simple scan and print job. The label is wrapped around a small metal paint can style candle holder that is filled with a blue scented candle. The best way to describe the scent is a mixture of a tropical beach with sun tan lotion. This is what I imagine the beaches in JAWS The Revenge smelled like. The flag has neat stitching and a fairly high quality image printed on it. The image is recreated from the silk screen artwork on the sides of the Killer Shark arcade cabinet with "Killer Shark" added to it. The image on the flag is on one side which makes the flag perfect for hanging up on a wall or entrance to your game room or arcade workshop. Overall both pieces are great to add to either your arcade or horror collection. Honestly if I had a couch in the arcade workspace I am setting up, I would've ordered a pillow as well. Unfortunately these items were limited time releases so I hope you took notice of our tweet and went over to Horror Decor and placed an order. If not, sign up for their e-mail newsletter for updates. They do occasionally resurrect previous limited time items.